Gayle continues to expand her knowledge of products and destinations, including World Cruises and Grand Voyages. 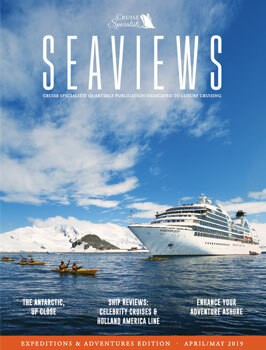 Sailing as a Voyage Host for Virtuoso Voyages, she has recently cruised in Asia and the Mediterranean. She has also sampled the river cruise experience and encourages her clients to “sail” through Europe’s heartland. Gayle is very familiar with both the Caribbean and Alaska including Alaska CruiseTours. Not to overlook the shore experience component, Gayle traveled aboard the Rocky Mountaineer railway in Canada, which is the perfect addition to an Alaska cruise. Gayle has been honored with customer service awards and prides herself on maintaining a commitment to excellence in all her client relationships. From the first-time cruiser, to seasoned travelers who wish to spend weeks or months at sea, Gayle understands all that is necessary to plan a voyage that fits each client’s desires. We have been working with Gayle for many years. She is like a part of our family. Gayle is professional, patient, and competent. We know we can always count on her to help us choose the best cruise for us. We look forward to many more opportunities for cruising in the future. I really like working with Gayle, she is always very helpful when I want to make reservations. She also helped me with the selection of our excursions. I appreciate all the help she gives me. Gayle has always been there for us, guiding us in the right direction on such complicated matters as insurance, choice of itinerary, and getting the best possible deal. Just a month back from our first ever cruise we were looking to go on another. We did a bit of Internet homework and got an idea of what we wanted but nothing we could find was just right. We went back to Gayle Takashima, who did a wonderful job planning our first cruise, and she promptly found several cruises that fit our parameters, put a hold on a special cabin (aft facing), offered a low deposit and additional shipboard credit. What's not to like? So we booked the trip that we didn't find, got the ideal cabin that we weren't aware of and a good price thanks to Gayle. It was too easy so naturally I was suspicious but it all worked out wonderfully. Experience counts and Gayle has it. Gayle is very easy to work with. She is responsive to my requests for information and is extremely helpful in getting my trips planned. I have some very specific travel preferences and Gayle is always ready to tackle getting my ideas and preferences met. I've been working with Gayle for years and she has always taken very good care of us.